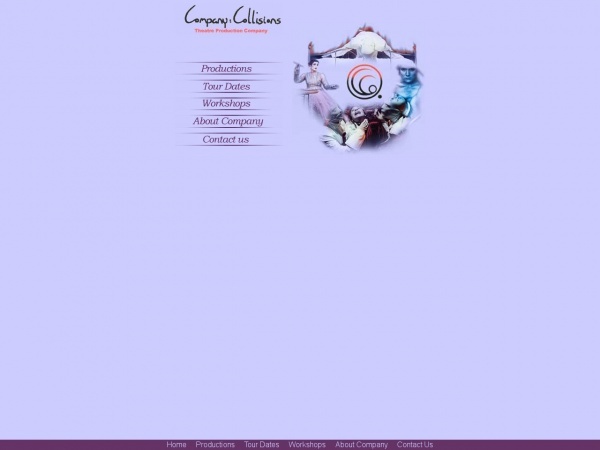 Founded in September 1999, Company: Collisions produces original theatre pieces for the stage and the street as well as teaching in schools, colleges and universities. Since its launch, the company has created a distinctive style of physical story telling. Using striking visual imagery and high-energy performance designed to ignite the soul and inspire the mind. Not concerned with the accurate representation of pedestrian life and psychological realism, the company aims to use the stage to express a heightened state of reality with stories of extreme human experience. Embracing a diverse mix of art forms, the company works closely with composers, designers and writers to create a rich, engaging style of theatre. After an inspirational Edinburgh Festival in1999, Tanushka Marah (artistic director) and Alice Hartmann (performer and writer) set up Company:Collisions to begin work on an ambitious re-interpretation of Mary Shelley"s Frankenstein. Learning theatre practitioners and practices such as Butoh, Suzuki, Martha Graham, Grotowski, Yoshi Oida and Clowning, we wanted a dedicated ensemble group that would create work with a strong commitment to emotional truth and intellectual depth, who would see each production as a way of life rather than just another job. We intend to create riveting theatrical work which communicates clearly to the audience. Fired by a passion for literature, philosophy, film and mythology, Company: Collisions is on a mission to enchant, intrigue, inspire, stimulate debate and entertain. Although the company has its comings and goings with each show there are some core members who have worked on almost every show and have contributed to what can now be recognised as the company"s style. Winner of the Michael Grady and the Stochkhausen award for composition, Jules is the company"s resident composer and lighting designer. He sorts out everything from sound effects to original compositions. It is a huge benefit to work with a composer who custom-creates sound for each production. Oh yes, and his lighting design is excellent, too! As the artistic director, manager and performer for Company: Collisions, Tanushka has made possible all of Company:Collisions work to date. She is very tired but wouldn"t have life any other way. French-born Alice began the company with Tanushka and though she has not worked as an actor with the company for many years she still gives artistic and managerial advice and support. Formerly a member of Fusion and Kaboodle theatre company, Denise has travelled much of the word performing and has already been described by the press as a ‘veteran’ performer – which she did not like! Denise performed the title role in Medea and for all the other productions she has acted as guest director or artistic advisor. An experienced journalist, Oz edits scripts and writes all the press and marketing material. He is also our resident morale officer (a hugely underestimated job) and when playing catch-the-ball doesn"t stop people taking themselves too seriously, he ensures that happens – down the pub! Known for her magnetic androgyny Sarah enjoys playing both male and female roles and has performed in almost all of the company"s productions to date. Sarah also contributed to the running of the company. Already a maths teacher, drummer, paragliding instructor, dancer and actress, Julia suspects she"s got too much time on her hands and now hopes to become a fire-woman. The precious moments she spends with the company involve performing in the company’s street theatre productions. Luan has performed in much of the company"s work to date. Mother to young Matilda, Luan is also a co-founder and artistic director of RagRoof Theatre, performing street theatre in England and abroad. She has a passion for partner dancing and makes everyone happy with her amazing cooking! John is a performer and often complains about being the only male in the cast, especially when he has to wear a tutu. An accomplished dancer, performer and workshop leader John also runs his own company- Freefall Physical Theatre.